After few seconds you can browse to localhost:7979 and point to your /hystrix.stream servlet. Assuming your application is clustered, most likely you will add Turbine to the party. If you are using Hystrix, you know about all of this already. But one of the questions I am asked most often is: why these metrics are so short-term? Indeed, if you look at the dashboard above, metrics are aggregated with sliding window ranging from 10 seconds to 1 minute. If you received and automatic e-mail notification about some occurrence on production, experienced brief slowness or heard about performance problems from a customer, relevant statistics about this incident might already be lost - or they might be obscured by general instability that happened afterwards. This is actually by design - you can't have both low-latency, near real time statistics, that are as well durable and can be browsed days if not months back. But you don't need two monitoring systems for short-term metrics and long-term trends. 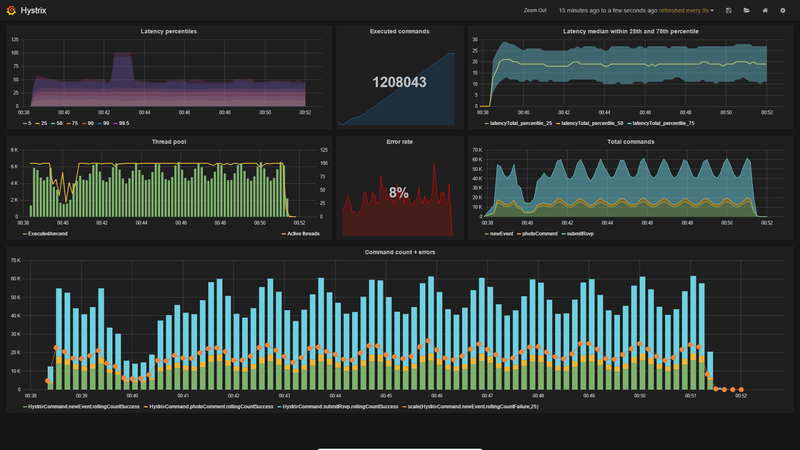 Instead you can feed Graphite directly with Hystrix metrics. With almost no code at all, just a little bit of glue here and there. The moment Hystrix publishes to Dropwizard metrics, we can redirect these metrics to SLF4J, JMX or... Graphite! Metrics ignored in standard dashboard, like lower percentiles, total counters, etc. Examples can be found on previous screenshot. It totally depends on your use case, but unless your system is on fire, long-term statistics that you can examine hours or weeks after incident are probably more useful than built-in dashboard. Can you share the dashboard json please?